Staff from our MGF Yorkshire Depot in Castleford and our Engineering and Support Centre in Astley, Greater Manchester have supported local charity initiatives and held toy collections for under-privileged children. MGF Yorkshire arranged a toy collection and delivered £400 worth of toys to Airedale Children’s NHS Trust Centre in West Yorkshire. The local children’s centre is a place where under-privileged families can access support and is an invaluable service in the local community. The centre facilitates toy collections annually at Christmas and arranges distribution of the presents to children living in difficult situations and social care. MGF Yorskshire’s Operations Manager, Amanda Lupton, commented “I am extremely pleased that MGF Yorkshire have managed to collect so many toys. The gifts will be given to under privileged children who would not usually receive anything and I must say a big thank you to all of our staff who have donated generously to this very worthwhile cause”. 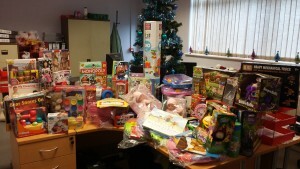 At the MGF Engineering and Support Centre in Greater Manchester Kim Dewhurst, HR Advisor, arranged a toy collection to support the North West Salvation Army Christmas Present Appeal and collected over £200 worth of toys. The Salvation Army run an annual appeal for donations of new, unwrapped toys and gifts for children, families, older people and homeless people in need at Christmas. MGF are proud to support our staff members in facilitating charitable collections such as these and see this as one of many ways we can contribute positively towards the communities in which we operate. For more information about MGF’s charitable activities please browse our website news section or contact our Head Office on 01942 402 700.